Live, Laugh, Laura! 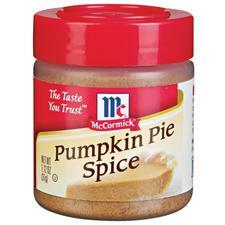 : Who Needs Apple Pie Spice? Thursday, my coworkers and I decided to surprise our boss to celebrate Boss's Day! Yes, Boss's Day is Friday, but a lot of people weren't going to be around Friday so we did Thursday. 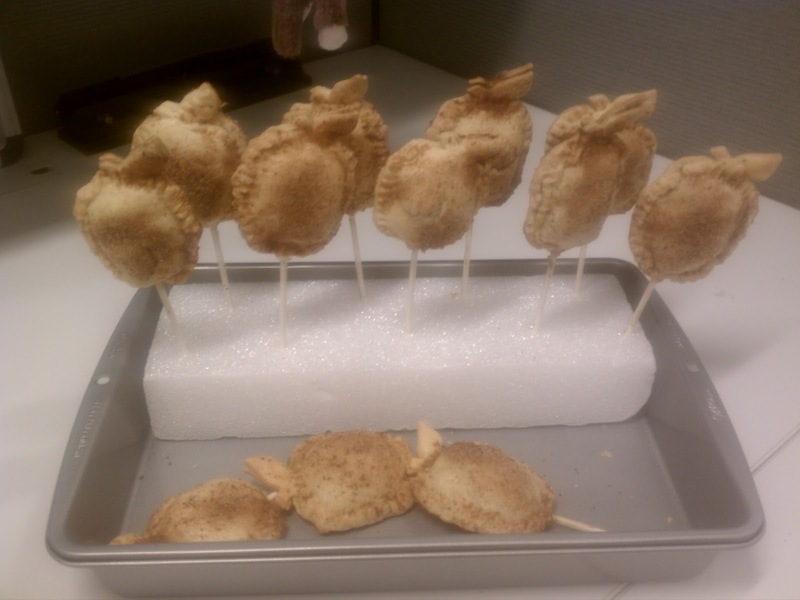 We know that our boss is an apple pie lover so my coworker, Natalie, mentioned how our friend Rebecca recently made Apple Pie Pops from the blog Buttercup. We thought it might be a nice twist on his favorite. I volunteered to do the baking. 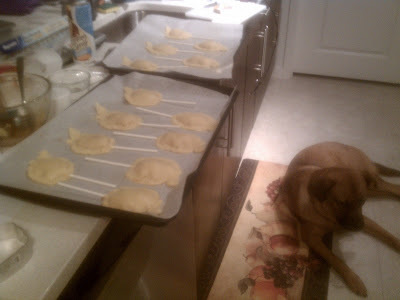 I was really attracted to attempting this recipe for a few reasons. 1) I have been looking for new fun things to bake. 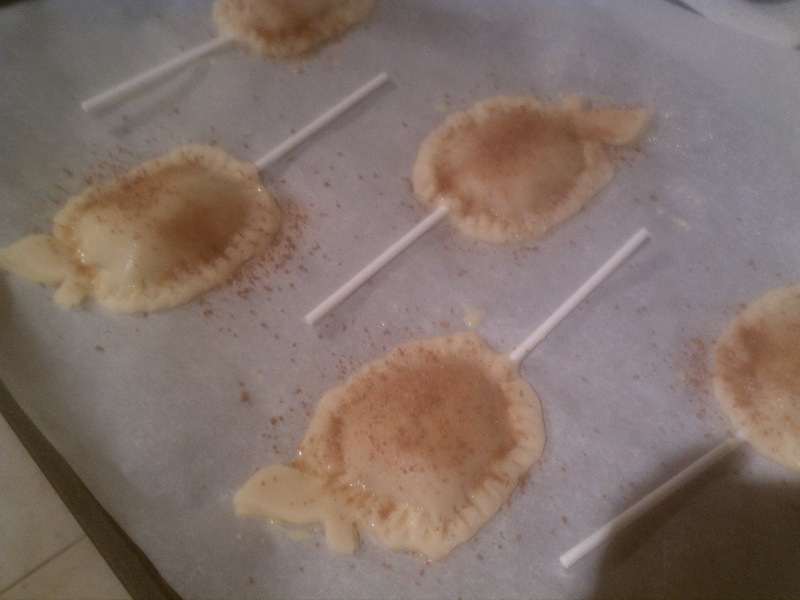 2) These won't bake for too long because they are smaller than a whole pie. 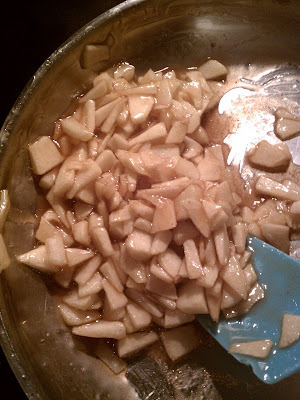 3) It required cutting less apples than a bigger pie. 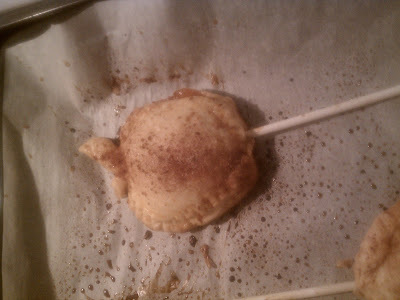 4) Pre-made dough and pre-mixed spices were A-O-Kay! I looked, and looked........and looked. Apple Pie Spice was no where to be found. Having never made any sort of apple pie before, I was a bit panicked about this. I decided to look up what was in this mix and get those spices. I had cinnamon, I found some nutmeg, I found some allspice...and I decided to go with a litttttle bit of brown sugar and skip the cardamom....it was sort of pricey. I knew I could find uses for the other spices, but I have only heard of using cardamom once ever before (in an interesting whoopie pie) so it didn't seem like a necessary investment. (Speaking of investing in spices...my friend Shirin jokes about her kitchen spice inventory in her cute blog: Diary of a Messy Kitchen)! 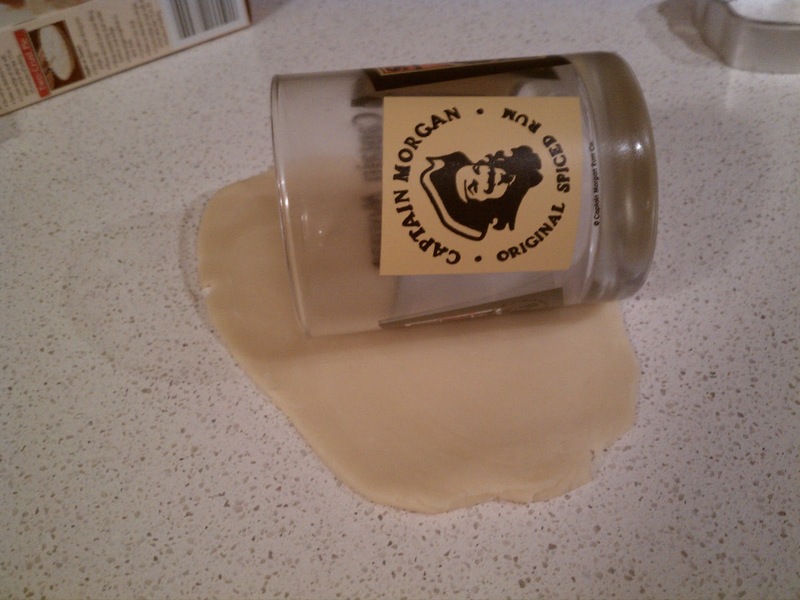 I have to say, this was really easy to mix up and to my surprise the sugar mixture was really easy to clean off my pan :-). 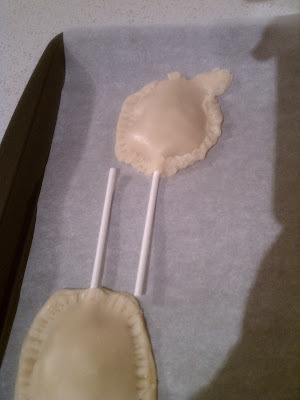 Once the filling was ready, I took out the pre-made pie crust and use an apple shaped cookie cutter for the crust of the pops. I got about 9 pieces out of each crust, but there was a lot of extra dough. This is when I remembered that I don't have a rolling pin...whoops!...well who needs a rolling pin when you've got the captain helping you out? I got a total of 13 apple pie pops put together on 2 trays...Milo was in his normal kitchen supervisor position. Then they went in the oven...and I crossed my fingers that they wouldn't explode (especially around the stick). 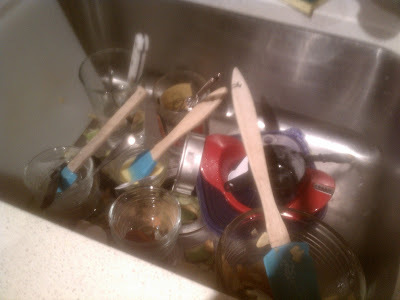 As they baked, I cleaned up the counter, and was surprised at how even though I felt like I used a lot of kitchen supplies, the sink was only full of little dishes! I'm used to a sink FULL with big bowls after I bake. About 15 minutes later, out came the pops! And to my surprise...they actually sort of looked like apples despite how much I thought I mutilated them during construction! 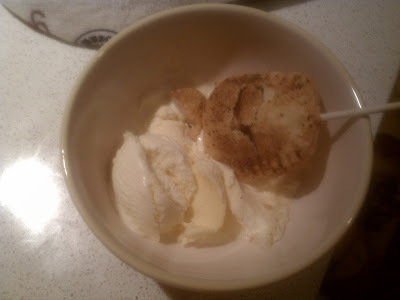 A few of the pops cracked open....I decided to take the worst one and make myself a late night snack when I was done ;-)...these mini pies are PERFECT with ice cream! 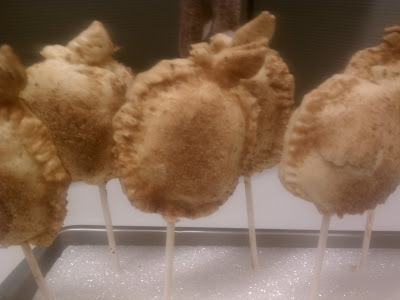 I still wasn't sure if the apple pie pops would actually stand up. They seemed a bit top heavy so I didn't have a lot of confidence. Even after I let them cool for a while, they weren't feeling too stable. However the next day at work I had a 9 out of 12 success rate when I stood them up! Look! They were a big success! The branch (and the boss) thought they were great! (So there missing Apple Pie Spice!) I think I might try to make these again this weekend, but perhaps without the pops. Maybe make them "bites" with smaller cutouts....hmmmmm. Sidenote: Sorry about my blurry pictures...I need to look into why my phone on my camera stopped focusing, but it was hard while I had messy hands. these look awesome - sorry i missed them! 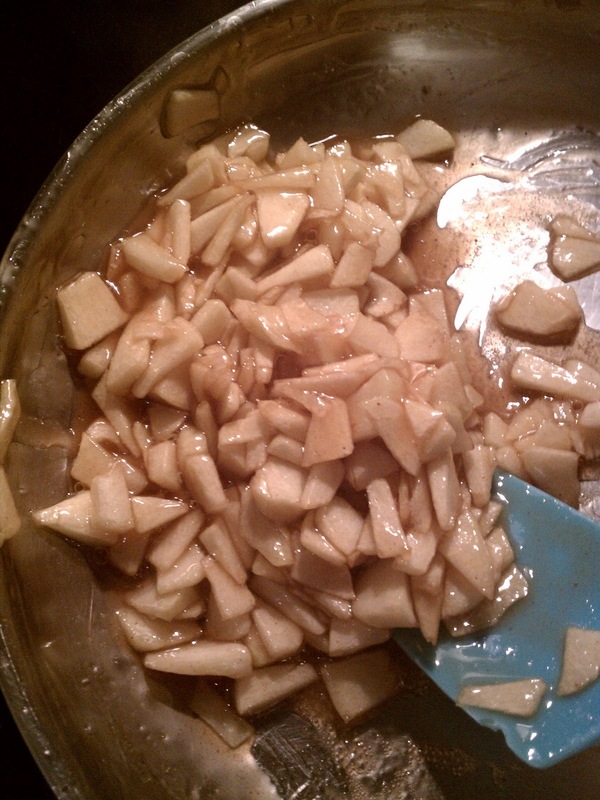 I think your fresh spices would be better than the stale old apple spice. But oh, cardamom is AMAZING...my favoritest spice! The apple pie pops are adorable. Love the concept.